The idea of escaping civilization is as old as civilization itself. 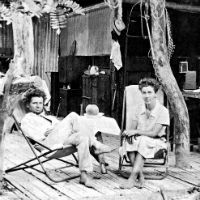 In 1929, a German physician by the name of Friedrich Ritter and his patient-turned-lover Dore Strauch set out to find their version of paradise on the uninhabited island of Floreana, one of the Galapagos Islands off the Ecuadorean coast (it was where Charles Darwin developed his theory of evolution). Ritter, a devout Nietzschean who considered himself something of an übermensch, despised civilization and settled on Floreana with Strauch, who worshipped the ground he walked on. They would not remain the small island’s only inhabitants for long. Other Germans soon arrived. First a small family, the Wittmers, settled on the other side of the island. Not long after the eccentric Baroness Eloise von Wagner and her two lovers showed up and threatened to turn the island into a tourist resort called Hacienda Paradiso. Enter L.A. philanthropist captain George Allan Hancock, who fancied himself an explorer and made frequent trips to Floreana on his research vessel Velero III. Hancock—for whom L.A.’s Hancock Park is named—was instrumental in Ritter and Strauch’s survival, returning often with new gifts for the islanders. His visits to the Galapagos Islands were in large part responsible for the unwelcome media attention that soon focused on Ritter’s experiment. The press scrutiny only increased when Hancock shot a pirate film starring the Baroness, who became an international celebrity known as the “Island Empress.” That’s where the trouble, which eventually led to the mysterious deaths of four people, started. The Galapagos Affair: Satan Came to Eden is a thrilling and well-crafted documentary about intrigue, murder, and the failure of utopian ideals. Written and directed by Dayna Goldfire and Daniel Geller, it features Cate Blanchett, Diane Kruger, Connie Nielsen, Gustav Skarsgaard and other notable actors giving voice to the islanders’ diaries and memoirs. The film opens for its L.A. run at the Laemmles on April 18. Man-made paradises and utopian communities aren’t reserved for remote tropical islands. In the 19th and early 20th centuries, many alternative societies existed in the United States, some of which lasted longer than others. Here are four utopian communities including a local one that, like Dr. Ritter’s dream for Floreana, didn’t quite work out. Located 35 miles from east of Syracuse, the Oneida Community was founded in 1848 by John Humphrey Noyes, a radical utopian who believed in “Complex Marriage,” a system in which everyone is married to everyone and children are raised communally. Noyes actually coined the term “Free Love.” The Oneida Community boomed for a while, attracting as many as 300 residents, but it was officially disbanded in 1881 due to internal power struggles. The Oneida name lives on today with its world famous cutlery and tableware. Founded in the Neosho Valley in 1856, Octagon City promoted vegetarianism and architectural experimentation. The colony was to be built around an octagonal main structure in the middle of four square miles of land divided into 16 triangularly shaped farms that were planned to accommodate 60 families. These ambitious plans never came to pass; the colony only produced one log cabin. Within two years the harsh conditions and various diseases had decimated the population. Nothing remains today except for the aptly named Vegetarian Creek that cuts through the valley. Based on transcendentalist ideas—the belief that the world as it appears to us can be transcended in favor of a connection with the divine fabric of the universe—the Fruitlands commune was founded in Harvard, Massachusetts in 1843. Residents were to be self-reliant, grow their own food, produce their own clothes out of linen, and give up any personal property. The commune only survived a few months until the brutal realities of the New England winter put a stop to the experiment. Maybe the ban on any fabric that was warmer than linen should have been reconsidered. In the early 20th century, the Antelope Valley was the sight of the socialist Llano Del Rio colony. It was founded in 1914 by Job Harriman, the first man to run for vice president (and later mayor of L.A.) on a socialist party platform. Harriman’s political ambitions were ultimately fruitless, so he launched the colony to promote his socialist ideas. Llano Del Rio thrived until internal struggles and disputes over water rights forced the approximately 1,000 members to relocate to Louisiana in 1917. A few elements from the original structures, like the hearth and chimney in the old assembly hall, remain on the site, which sits approximately 20 miles east of Palmdale. A 46-Year Delayed Aretha Franklin Documentary Finally Debuts in L.A.